MAD Air Suspension Systems give the advantage of air pressure adjustment in order to give the exact amount of support needed for each specific load. This results in increased comfort through optimum auxiliary air suspension, which can be easily operated from the dashboard whilst driving, or en route at a petrol station. Get a quote for springs by make, model, type and year. Just select your options, fill out your details and press the 'Quote Me Now' button. One of our staff will get back to you asap. These air bags have no problem whether the vehicle is slightly or heavily laden, or even under use of a tow bar. The black air bags give the solution for a better ride in terms of both comfort and safety. Suitable for Light Commercial Vehicles, Pickups and Motor Homes with a restricted fitting space. Are fully adjustable to guarantee a comfortable and safe ride under all circumstances, whether laden or unladen. The Double Chamber stands alone, so it is independent from the original suspension. This air system is adjustable from 0.5 bar up to 8.6 bar for maximum power and comfort. Provide support from the inside of the original coil, preventing them from blocking or snagging. This system works with a maximum air pressure of 2.5 bar. The airbag supports the original suspension, and the force of the two together can be adjusted via changing the air pressure. The coil spring supports the airbag in order to keep it in shape. Suitable for passenger cars and small, Light Commercial Vehicles. 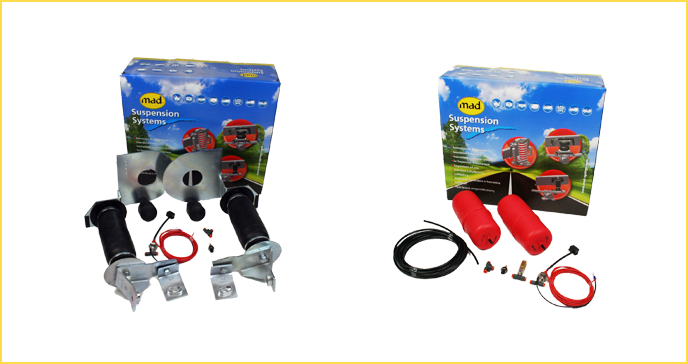 Probuild Transport Systems are proud to be a UK distributor of MAD Air Suspension Systems. Probuild have been manufacturing car transporters since 2003 and started using MAD Air Suspension Systems shortly afterwards.